As more and more people are purchasing Apple Smart Devices like iPhones and iPod Touches, the after market accessories industry has definitely created a mind field for the user. There is just so many cases available that it's not funny but everyone now and then, a case does come to our attention which definitely needs a review. This case is the Hive Gaming Case from Incipio that creates the perfect accessory for your iPod Touch 4G... especially if you're a gamer! Although the case does offer the user some decent protection should a "drop" occur, the highlight of this case is that it has been designed for gaming. The unique shape of the case and the texture ensures that your grip on your iPod Touch will give you that edge while playing games. Best of all, it comes in six different colours and even comes with two screen protectors (Crystal & Anti-Glare). Add in a cleaning cloth and you have everything (almost) you need for your iPod Touch 4G. 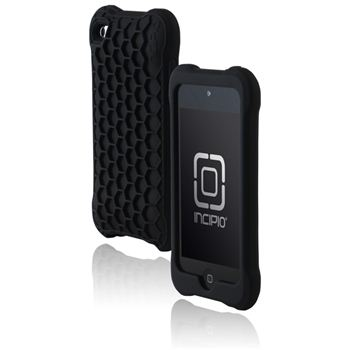 In terms of installation, Incipio makes things extremely easy and your iPod Touch 4G just slides into the case. The trickiest aspect of the installation is putting the screen protector on but if you've done this before, you should have no problems. Even if you haven't, the instructions for the screen protector are quite detailed. Once installed, we were ready for gaming. The moulded design of the Hive with its dermaSHOT silicone material not only gives you additional gaming grip but it also boasts an anti-static coating on it. This ensures total grip for your iPod Touch. I also liked the honey comb feel of the back of the case that makes using the iPod Touch 4G a treat. Whether I was playing a racing game or a first person shooter or just surfing the web, the Hive Gaming Case is easily one of the best cases that I have tried for this device. With additional protection thanks to the shock absorbent technology plus full access to all controls on your device, this case comes highly recommended!